Foreign remittances sent by our migrant workers from abroad now account for the largest chunk of our foreign earnings. The money sent home by migrant workers in Bangladesh play a crucial role in the country's economy. Since the 1990s, remittances have played an increasingly important role in the national economy of Bangladesh. These are earnings of our workers, close to seven million of them, spread over 140 countries of the world. But the foreign employment sector is fraught with fraud. Migrant workers struggle every step along the way, from finding honest recruiting agents to securing decent jobs abroad. They don't have direct links with employers. They have to go through middlemen, whose fee is taken from migrant workers. Moreover, many manpower agencies are not recognised for their work. Instead they have to face the charge of cheating aspiring migrant workers. A number of fraudsters in Bangladesh are cheating innocent job seekers by offering them baseless job in exchange of a hefty amount of fee. Recently two Bangladeshis had been stranded in Brasileia, Brazil, according to a story titled, 'Bangladesh in the Brazilian Amazon' written by Gabriel Elizona of Al Zazeera on January 11, 2012. The two Bangladeshi victims are AHM Sultan Ahmed and Abdul Awal. Ahmed is a trained painter and once worked in Greece while Awal worked in Malaysia as an electrician. The two arrived at one of the most remote corners of the Amazon in Brazil after a long, dangerous journey from Dhaka 21 days ago. As the story goes, they paid about $9,000 to a broker to arrange the journey. The trickster also promised easy and high-paying jobs in Ecuador. Ahmed and Awal paid up and flew from Dhaka to Dubai (4 hours, 30 minutes). In the UAE, they boarded a flight that brought them non-stop from Dubai to Sao Paulo. It was about a 15-hour flight. Because they didn't have a visa for Brazil, when they landed in Sao Paulo where they could not leave the airport and had to transfer to another flight to Santiago, Chile (3 hours, 15 minutes). After a long layover in Santiago, another flight to Quito, Ecuador, (5 hours) where they stayed for a few days. Soon they found themselves on a public bus for a 26 hours journey from Quito to Lima, Peru. From there they transferred to another bus and another 12-hour journey over mountain passes to Inapari, Peru, a dusty border town with Brazil. Still with no visa for Brazil and in a far away land and culture they didn't know, another local shady character demanded $600, saying to secretly drive them to the Bolivian side of the border and then guide them the few kilometres through the jungle into Brazil. But the two Bangladeshis only had $300 in cash left. So the man asked for Ahmed's cellphone to cover the rest. Having no other choice, he handed it over. Twenty-one days after leaving Dhaka, the two straggled into Brasileia. Ahmed had $20 in cash and a few loose coins in Brazilian money. And no cell phone to call home. They bought a snack and some water after their arrival. Then they had only $10.They delivered their passports to the local federal police offices for processing for a work permit. The story says their wait time is averaging four weeks. Certainly, the two Bangladeshis face an uncertain future in a distant land. Rezaur Rahman, an International Human Rights activist and celebrated Bangladesh born Canadian Barrister and Solicitor has recently revealed an alarming story. 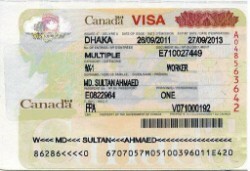 According to him, a few fraudsters are offering jobs to innocent Bangladeshi job seekers in Canada that does not exist at all. In the year 2001-2010, about 2192 Bangladeshi workers came to Canada in comparison to 261985 from the Philippines, 68065 from India and 3348 from Pakistan. What needs to be done to protect the rights of Bangladeshi migrant workers? “There is a great need for a national awareness campaign through news media, social networking sites and social organizations. People should be made aware of the strategies of the fraudsters and be given the tools to identify a fraudulent job offer. I wish the Bangladesh High Commission in Canada had enough resources to verify the genuineness of any job offer. Alternatively, the local Bangladeshi organizations in Canada might come forward to verify the genuineness of a job offer that is made by a Canadian employer of a specific province”, Rahman suggested. Asked about the current situation of Bangladeshi migrant workers in Canada, Barrister Rezaur Rahman said, “many of them don't know that after working in Canada for two years they can apply for the permanent resident status. However one of the requirements to become a permanent resident is to score certain point on the basis of proficiency in English and French. Almost all the Bangladeshi migrant workers that I have met in Canada have no knowledge of French and most of them have poor knowledge of English. So, even if they work for two years in Canada they may not be successful in getting the Permanent Resident status”.